The career trajectory of Robin Thicke is a strange one. For years, he was a staple on R&B radio, the blue-eyed soul singer getting played on urban stations with no help from the pop side. Then he released “Blurred Lines” and everything changed. Although the song was one of the biggest hits of the year, the video was provocative, and there was a strong reaction against the song's lyrics. Thicke did not know how to handle the spotlight, and he quickly unraveled. Since the fallout from that event, the “Blurred Lines” suit, and a messy, public marital split, Thicke’s struggling to find his way. His “Get Her Back” single in 2014 was overlooked but impressive—daringly quiet at a time when all of R&B was muscling up. 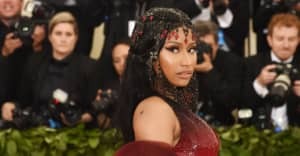 Today he released a new song with Nicki Minaj that explores similar themes: “Back Together.” It sounds like Thicke has been listening to a whole lot of French house—this is heavily-filtered, beefed-up, 21st-century disco along the lines of Modjo or Breakbot. It’s also a blatant nod to Michael Jackson, which fits the current pop climate, and Nicki steals the show with a sexual reference to a Presidential candidate.